Too young. Too full of life. Our dearest, sweet, beautiful, intelligent, zestful, restless, caring, indefatigable, force-of-nature Dana Marie O’Neill was pulled from our arms on the rain-soaked evening of December 13th. The foe was breast cancer; an adversary she had seemingly vanquished over the course of an eight-year battle, but one that recurred two years ago and to which she finally succumbed at the youthful age of 57. Over the span of her bustling life Dana accomplished more than most can even dream. Hailing from Santa Cruz and San Jose, she migrated south to attend UCSB, graduating with a degree in Psychology. After college Dana moved to Steamboat Springs where she led whiney packs of troubled teens out for weeks at a time through the Colorado Rockies. There in those rugged climes she became a proficient kayaker, fearless climber and expert skier, and developed something of an insatiable lust for adventure. The latter soon tugged her along a meandering, eighteen-month solo trip through Central and South America wherein she immersed herself in the Brazilian Marti Gras, got robbed at knifepoint in Rio, hitched boat rides with indigenous people up to the headwaters of the Amazon, got utterly lost in the flooded rainforest for several days, taking shelter from a downpour in an abandoned lean-to before being found and led to safety by shepherds. She then pushed further south to Patagonia, then back north along the Andes where she was the only woman on two climbing expeditions, each summiting peaks of over 20,000’. Later she crawled through the centuries’ old, unmapped silver mines of Potosi, paying her guide in the local currency of coca leaves and dynamite. In Ecuador she came close to dying of pneumonia in a dank traveler’s hovel but, once recovered and reinvigorated, pushed overland through the murderous region of Medellin, trudged north up the unpaved isthmus of the Darian Gap, parked for a few months to hone her Spanish skills in Guatemala, then on to Mexico where a rip current dragged her out into heavy Pacific surf and nearly drowned her. She survived by mustering a harrowing swim to shore during which she vowed to settle down and return home, which she promptly did only to run out of gas en route in a rental car at 2:00 a.m. in South Central L.A.
She moved back to Santa Barbara in 1991, adding to her scholastic résumé an MFCC degree from Cal State Northridge and writing her thesis on—what else?–Wilderness Therapy. 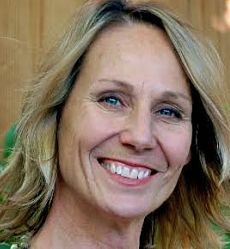 After working as a translating mediator for Ventura County Superior Court she repurposed her skills into a successful real estate career here in Santa Barbara. Then, in 1997 she married her longtime and patient fiancé and promptly launched headlong into the next phase of her adventurous life by giving birth to her two sons—verily the joys of her life—who she then began dragging along on her seemingly endless secession of further adventures including Canada, Mexico, Kenya, and even an arduous climb up to the top of Half Dome, and all in just the past year. Dana is survived by her mother and father Beverly and Bill O’Neill, siblings Rory, Kirk and Steve, uncle Jack O’Neill, cousins Janis, Bill and Rio Spicer, husband Robert Johnson, sons Luke and Dane Johnson O’Neill, as well as an expansive bevy of friends and admirers and fellow “Burners” the world ‘round. A memorial service is scheduled for January 23rd in Skofield Park. In Dana’s own inimitable words, “It’s a short spin on a little blue ball.” By which she meant, Don’t squander it!